Since the 1870s, The Bowery Mission has served New Yorkers experiencing homelessness and hunger. Each year, The Bowery Mission provides more than 653,500 hot meals, 167,300 nights of shelter, 46,400 articles of clothing, 13,300 showers and 1,300 onsite medical, dental and optometry exams. Each meal and every service is an invitation to residential and community programs that help clients make progress. Each year, the Mission serves 350 adults in its residential recovery programs and 800 more at the Community Hope Resource Center. To empower children to thrive and succeed, The Bowery Mission also offers year‐round opportunities for enrichment through City Camp, culminating in summer camp for 900 children in the Poconos Region of Pennsylvania. 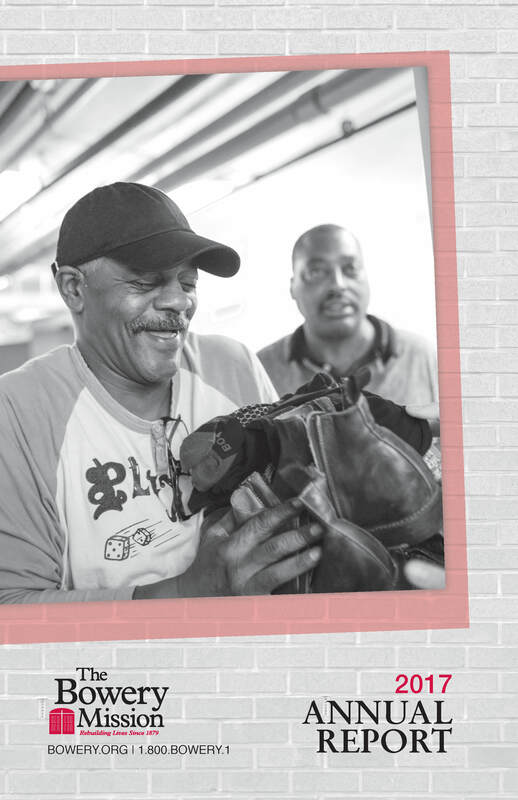 The Bowery Mission expanded its front‐line services to new neighborhoods by uniting first in 2016 with Goodwill Rescue Mission and then in 2017 with New York City Rescue Mission. Our work is privately funded by the generous donations and in-kind gifts of caring individuals, and supported by the efforts of thousands of volunteers. As I look back on 2017, I am filled with joy at the lives changed through your support of The Bowery Mission! As you may know, homelessness in New York City has reached the highest levels since the Great Depression. There are more than 63,000 people homeless in New York City—that’s nearly one in every 128 New Yorkers. We may be the financial capital of the world, but our homeless and working poor neighbors experience extreme suffering. In order to more effectively combat the epidemic of homelessness in our city, New York City Rescue Mission and Goodwill Rescue Mission have joined forces with The Bowery Mission to meet the needs of significantly more people across the New York metro area. With over 400 years of combined service, we are three historic organizations becoming one to fight against poverty and homelessness. Together, we are sharing resources, collaboratively fundraising and providing an enhanced continuum of care for men, women and children – so that we can say “yes” to more people more often with better services. Thanks to your generosity and prayers last year, thousands of men, women and children experiencing hunger and homelessness found renewed hope and new life. As we bring together more caring partners like you, I look forward to seeing God transform more lives in 2018! P.S. See firsthand how your support changes lives! Give us a call at 1-800-BOWERY-1 and we’ll be glad to give you a tour of the great things happening inside our Red Doors.